All is well!...For Sharman Joshi in the year ahead, foresees Ganesha. Young and full of beans, Sharman Joshi is vivacity and talent personified. Many would agree that he hasn't yet received the fame and adulation he truly deserves. And yet, despite the handful of films he has done, Sharman has managed to create a niche for himself. A theatre actor himself, Sharman belongs to a colourful Gujarati family of seasoned theatre persons. His father Arvind Joshi and uncle late Praveen Joshi are known theatre actors. Sharman is the younger brother of TV serial actress Manasi Joshi (of Saaya fame), and has worked in many Hindi, Marathi, Gujarati and English stage productions. Few know that Sharman made his film debut in an art-film Godmother. People rather remember him for his role in Style. After a spate of films similar to Style, Sharman did some substantial roles in movies like Rang De Basanti, Golmaal, Life in a Metro etc. However, it was the hugely successful and widely appreciated 3 Idiots that brought Sharman a lot of recognition and adulation for his role as Raju Rastogi - the lower-middle class boy striving to make a mark in the big bad world. It was the same role that won him the Filmfare Best Supporting Actor Award. 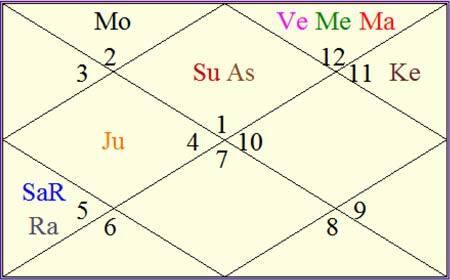 Venus in its sign of exaltation with debilitated Mercury creates Neech Bhang in Sharman Joshi's chart. Sharman is born with exalted Venus, which bestows him with great artistic skills. Exalted Sun indicates that his father is a reputed person in the society. And, this aspect also shows that Sharman's parents are supportive of him. Ganesha observes that in Sharman's chart, Jupiter will be transiting through the Ascendant till mid of 2012. Transiting Jupiter and Ketu will conjunct in Taurus post mid of 2012 and this conjunction will form Square aspect with Stellium of Mercury, Venus and Mars in Pisces in Sharman's chart. After December 2012, Rahu will be transiting over his Natal Sun. Transiting Saturn will maintain its opposition with Sharman's Natal Sun throughout the year ahead. Ganesha feels that Sharman's year ahead is going to be average for his film career, due to Saturn's difficult transit to his Natal Sun, and also because of a few other planetary transits. However, during the time between June to September 2012, Jupiter's transit shall be in his favour, so he may remain in the limelight during that period. He may do a few films during the year ahead, but is unlikely to compromise on the role. He shall ensure doing proper justice to his character. Ganesha feels that Sharman won't mind doing few films. After December 2012, Sharman will have to take a good care of his health, because transiting Saturn will be in opposition with his Natal Sun, while Rahu will be transiting over his Natal Sun. He won't quit theatre, but may not find much time to do theatre. However, he may appear on small screen during the year ahead. As an actor, he will be appreciated but Ganesha doesn't foresee any mega hits in his bucket during the year ahead. Sharman's personal life may remain hassle free, foresees Ganesha. Ganesha wishes him good luck for the year ahead.